Plural of "Baal"; occurs in the Bible fifteen times, always used with the article; not found in the Pentateuch nor in the poetical books. For a full discussion of the cult, see Ba'al-Worship. The true signification has been a matter of dispute. One of the leading explanations is that the expression is a "plural of majesty," equivalent to "the great god Ba'al," after the analogy of "Elohim" and "Adonim." Apart from other objections, it may be urged against this view that such phrases always become proper names, and, unlike "Baalim," are often used without the article. Hence other explanations are more plausible; for example, that Baalim are images of the god Baal, or that they are the various forms in which Baal is worshiped. 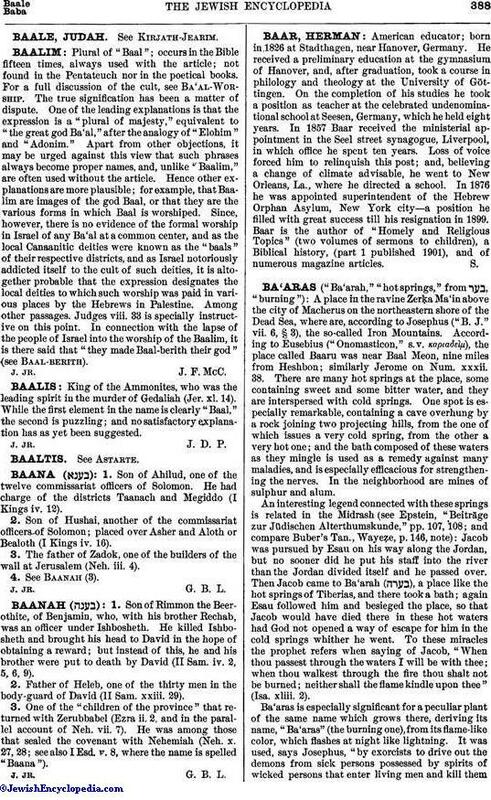 Since, however, there is no evidence of the formal worship in Israel of any Ba'al at a common center, and as the local Canaanitic deities were known as the "baals" of their respective districts, and as Israel notoriously addicted itself to the cult of such deities, it is altogether probable that the expression designates the local deities to which such worship was paid in various places by the Hebrews in Palestine. Among other passages, Judges viii. 33 is specially instructive on this point. In connection with the lapse of the people of Israel into the worship of the Baalim, it is there said that "they made Baal-berith their god" (see Baal-berith).